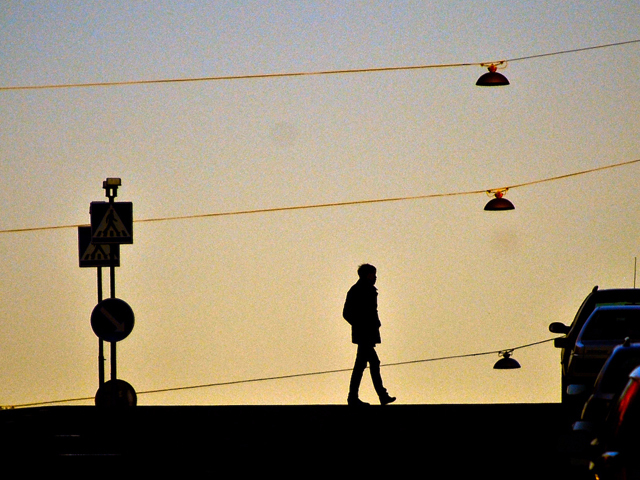 Mobility in a moment: Take a walk. Photo by Patrik Jones/Flickr. From the sidewalk, he looked over his shoulder and saw the street packed with cars. When he removes his headphones, the impatient symphony of horns hits his ear. But he says no. Today, he’ll go by foot. He moved one foot, then the other, then the other and the other, again and again. But how strange it felt! It was not what he expected. Freedom sprouted under his feet! Instead of regret, he was taken by this feeling of liberation. How surprising … it was just a walk from one bus stop to the other, but he knew immediately he should have done this long before. There was a bookstore on the corner he’d never noticed from his car, or the way the sun shone hot on the outside of the bus. He felt connected; the world of the city had opened to him. He grinned and turned up the volume. He escaped a jam and found a city. This week marks the beginning of “Mobility in moment,” a new series from our partners at TheCityFix Brasil focused on capturing the spirit of sustainable urban mobility in photos. These images are meant to impact their viewers and allow for reflection on the intangible qualities of mobility and urban life. TheCityFix Brasil will feature one photo with accompanying text – with “poetic license” – each week. We invite you, CityFixers, to submit your photos and text and help explore us across TheCityFix network experience the feeling of what it means to be a part of a livable, sustainable, walkable city. As cliché as it seems, the saying “a picture is worth a thousand words” has true value, for pictures capture our imaginations and evoke emotions in places where words tend to fail us. In our search to show the value of cities, human interaction in these spaces shows a compelling and convincing argument for sustainable transport and walkable streets that sometimes statistics simply cannot convey. For those who live in cities, these pictures can connect them back to the dance of cyclists, buses, and pedestrians that that they live with every day. For those not living in cities, photos can make the case for the vibrant, connected lifestyle it is possible to achieve on city streets. Photographs have the power to simultaneously unite us, and compel us to work towards building better urban environments. To submit photography or text to the series, contact TheCityFix Brasil editors at: contato@embarqbrasil.org. The first two installments of the “Mobility in a moment” series are live in Portuguese at TheCityFix Brasil here and here.